It seems like fads (like #TheDress) and jokes (like #RuinADateIn5Words) can be started, get a hashtag, trend on Twitter, make it into the Facebook sidebar, become a Buzzfeed listicle, then become a Wikipedia article and die all within about one infant sleep cycle. (I’m starting to measure all time in infant sleep cycles, the most important unit of time in my life) It feels like the internet is getting faster. Or maybe I’m just getting older. Either way, when I woke up this morning, I had never heard about #RaceTogether. I assumed it was some sort of marathon which started 52.4 miles apart and ended when all the participants crashed into one another. Boy, was I wrong. 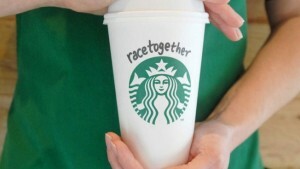 No, it’s actually Starbucks’ attempt to undermine all we hold dear by having their baristas write on cups. Depending on who you ask, it’s either a pitiful facade of social consciousness by a greedy megacorporation or an annoying expression of liberal guilt by an overreaching treehugger CEO. Oddly enough, I didn’t see much actual complaining about the initiative; I saw more articles defending the (completely optional) initiative as an interesting way for a company to encourage conversation about a very difficult subject in the modern world. Granted, the thought of the same company that made an entire nation learn snooty Italian words for “medium” and “large” trying to get people to talk about a major hotbutton issue while they’re already late for work seems kind of silly at first blush. Maybe as silly as expressing your love while you wait for your fries. And in reality, it’s probably a no-win scenario for Starbucks (and maybe for me, too—I’m a middle-class white man). But there is a lot to talk about here, whether it’s with a barista in a Starbucks or a crowd of protesters in Ferguson, MO. This one’s pretty easy: our purpose is to be a blessing to the nations. In addition, God gave us this commandment dozens of times in the Bible, without qualification or exception: “Love one another.” He never excludes anyone of any color in that command. While this is often co-opted by critics of Christianity to show our hypocrisy, it’s also a core point in Jesus’ message. He calls us to love one another, regardless of who those other people are, and when our culture is broken with conflict it is our duty to speak against that conflict with love. Aren’t all the “race issues” over? Maybe it’s obvious to you, but it’s clear when looking at today’s world that race relations is not “fixed.” Certainly, having a President of color is a step in the right direction, but the end of Dr. Martin Luther King’s speech does not culminate in a President with dark skin. His desire was for harmony, as ours should be. The fault is not with those who would “play the ‘race card. '” In fact, the truth resists the simplicity of “fault” in this case. Our world is not whole; we are still divided, and we should not be. What’s the point? Don’t we have bigger issues to deal with? Maybe you think that we should focus on more “spiritual” issues. Maybe…something like the creation? Where God created us all equal, male and female, and made us to worship Him in harmony? Or perhaps like the life, death, and resurrection of Jesus for the sins of everyone, black and white alike? Maybe the triumphant second coming, where Jesus will return in glory and crush sin and death for us so that we can all live in the beautiful unity we were intended for, regardless of what defines our differences now? There’s no getting around it. Jesus died for you, but if you act like you and the people like you are the only ones He died for, you’ll miss all the joy and beauty that God has to offer in diversity. Of course, it’s true: we do have bigger issues to deal with. The creation of the universe, the fall of man, the sacrifice of Jesus, and the coming age of perfect love and peace are all more important. So we should probably get this race issue out of the way so we can start focusing on that stuff. Of course, we’re never going to fix this broken country any more than we could fix the rest of this broken world before Jesus comes back to rescue us all from it at the final trumpet. But that doesn’t mean we shouldn’t pursue it. In fact, God means for us to seek the good of this world in which we are aliens. If I go to @Starbucks and get a #RaceTogether cup/comment, I’m going to see that as an invitation to a gospel presentation. Because only then will we be united. Want to investigate more into what the Bible says about race relations? John Piper’s book Bloodlines: Race, Cross, and the Christian is available on Amazon to download now, and if you buy it or any other Amazon product through this link you can help support Redeeming Culture at no additional cost to you. You can also see other ways to support us here. Thank you! This entry was posted in Current Events and tagged #RaceTogether, Ferguson, hashtivism, race, social justice, Starbucks. Bookmark the permalink.